My son is now 6 months old, almost 7 months, and time has flown by! At this age he is doing all of the fun things that babies do like roll over, pull up and get ready to crawl! 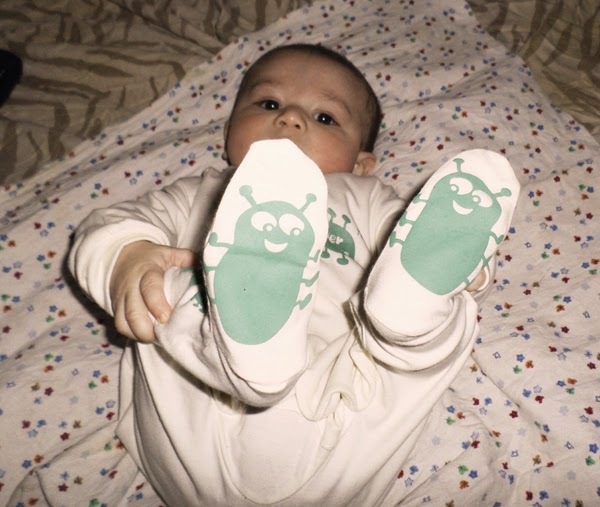 As such, this stage begets the fun and satisfaction of testing out great products such as this CREEPER CRAWLER all in one outfit, which hosts a plethora of little grip pads at the legs, knees and feet in the shape of cute little bugs, which allow baby to gain a good grip while learning to crawl/stand/walk. Available in pink, blue or cream in sizes 6-9 months an 9-12 months, these suits are designed to give baby the best traction with the least imposing grip possible! At €14.99 (approximately $20.00), these suits definitely provide a lot of fun and comfort to your little ones! They are unique, while providing a wonderfully simple fix for babies everywhere - no slipping, no fuss and nothing uncomfortable while learning to get up and going! 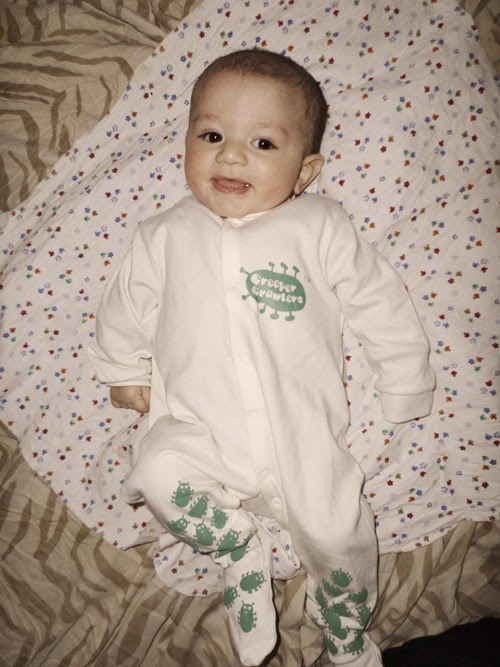 My son is pictured wearing the size 6-9 month cream suit and, as you can see, it is adorable and very comfortable (cotton) for him to wear! The bugs are cute and stand out, but are not overbearing or bumpy/raised and cause no discomfort at all! I love the way this looks on my son and he seems to be happy to share it with you and, and who wouldn't be! 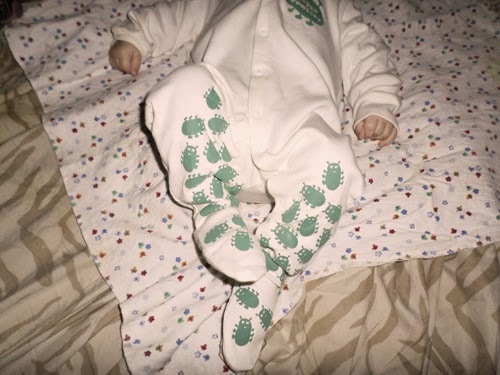 Look how sweet those radiant little bugs are all over his suit - especially the ones on his feet, which he is showing off especially for you! I think these are great value and a fabulous idea, which would make for a great birthday present or baby shower gift and will give back more while helping baby to get mobile! For more information on these Creeper Crawler suites, why not head on over HERE to find out how they came about and what they can do for you! You can also find Creeper Crawlers on Facebook, HERE and Twitter, HERE, too! I definitely give these a big thumbs up and may have to invest in more to keep us going! They are just so adorable! So, what are you waiting for!? Why not check them out, today and see where they take you! Disclaimer: I was provided with a Creeper Crawler suit for this review. All opinions are my own. Thank you! That's a really cute outfit on your baby. He really seems to feel comfy and free inside it. Thanks for the review.